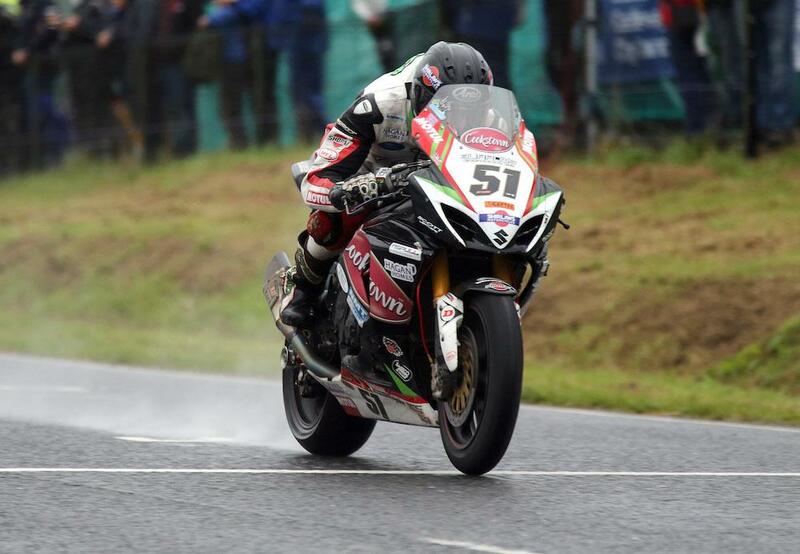 Derek Sheils topped the timesheets in a wet, opening Dundrod 150 Superbike practice as this week’s Ulster Grand Prix got underway in miserable wet conditions. Sheils’ fastest lap of 117.195mph place him ahead of Honda Racing’s Conor Cummins with Michael Dunlop third for Hawk BMW. The session ended early with a red flag after a hot front brake pad was reportedly found in pit lane. Organisers acted quick to bring all bikes back to the paddock in order to assess whether it belonged to a bike on track. Dan Kneen was third for Mar-Train Yamaha ahead of William Dunlop, also Yamaha mounted with the IC/MMB Racing squad with Derek McGee rounding out the top six on his BMW. Jamie Coward was seventh ahead of Tyco BMW’s Ian Hutchinson, while Ivan Lintin’s Devit RC Express Kawasaki replacement Steve Mercer was ninth with Padgetts’ Bruce Anstey rounding out the top ten.